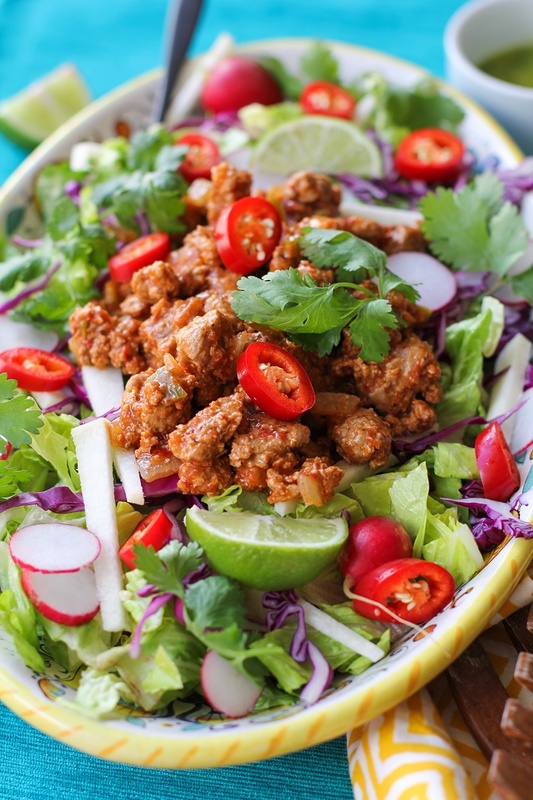 Crunchy Taco Salad with Spiced Ground Turkey and Cilantro-Lime Vinaigrette from Heather Christo’s cookbook, Pure Delicious. Oh.my.Gaaaah…have I got a book for you?! Heather Christo, creator of the food blog, HeatherChristo.com just released her cookbook, Pure Delicious on May 9, 2016. 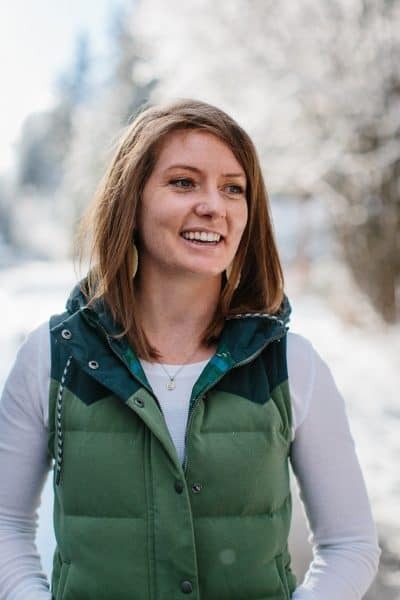 Just like the tasty eats Heather serves up on her blog, the book includes recipes from breakfast to dessert (and everything in between) that are free of gluten, dairy, soy, peanuts and tree nuts, shellfish, and cane sugar. Many of the recipes are even paleo-friendly, vegetarian, or vegan! With over 150 whole food recipes to choose from that exclude all of the Big 8 food allergens, the book truly is a something-for-everyone cookbook. Plus, it is marvelous for those who simply enjoy delicious food and a healthy lifestyle. Hands down, Pure Delicious is what I consider to be the ultimate Guide for living a happy, healthy food allergy-free lifestyle. Truthfully, I normally skip the introduction and beginning chapters in cookbooks and go right to the recipes – such was not the case for me for this book. I read every single word leading up to the recipes as Heather’s knowledge and expertise on food sensitivities drew me in. As someone who harbors her own set of digestive ailments, I picked up new-to-me information about dealing with food sensitivities. It is important to bear in mind that many folks who have a food intolerance don’t just have one but have several to tens of sensitivities (or allergies), which is why it can be difficult to dissect each and every food that causes health and digestive discomfort. For example, I know beyond the shadow of a doubt that I’m sensitive to gluten, oats (even gluten-free oats) cane sugar, quinoa, corn, peanuts, almonds, and cashews, and am starting to think bananas are a no-go, too. Making this discovery can be frustrating, but it should be more of a relief than anything else, because there is an easy solution: elimination and substitution. There are plenty of options for replacements for so many problem-causing foods – the key is to make a commitment to prioritizing your well-being. Christo begins Pure Delicious with the story of her and her family’s own journey with food allergies. Heather and her daughters, Pia and Coco, have numerous food allergies and sensitivities, which posed many struggles until the allergies were discovered as the culprit to their constant battles with illness. Having gone through hospital visits and allergy testing with her daughters, Heather’s book is designed to save us all the time, headache, and money that comes with doctors visits and battling insurance companies. Her book helps you to discover your own allergies and intolerances by providing a guide to an eight-week elimination diet, and all the resources you need to live a nourished, happy, allergen-free life. I’m going to give it to you straight: those of us who struggle with food intolerances know how overwhelming and difficult it can be to not only transition to, but to maintain a life without the foods that give us health ailments. Heather’s book makes the entire process simple…and I’m not just saying that. From start-to-finish, she provides you with the information you need to make the big life change to eliminate your own personal problem foods, and stick to a plan that keeps your body happy and healthy. Food allergy trends in the U.S.
How to transition your family (particularly school-aged kids) to living a life without problem foods. Coming up with a realistic food plan to facilitate cooking during the week. …and of course, she provides over 150 insane-o delicious recipes to help support your journey. The book is organized by recipe type: Soups & Chilis, Salads, Appetizers, Sides, Baked Goods, Pizza & Burgers, Pasta, Mains, Desserts, and Breakfast. When going through the book page-by-page, I marked the recipes I was instantly drawn to. The more I read through the book in detail, the more I add to my wish list. I could keep going, but I’ll spare you and just say you should probably pick up the book and make it a staple in your food life. Heather was gracious enough to let me re-publish one of the recipes from her book. 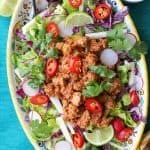 While the decision took me forever long to make, I settled on this crazy vibrant and delicious Taco Salad with Spiced Ground Turkey and Cilantro-Lime Vinaigrette. This recipe is the perfect well-rounded meal, is super easy to throw together any night of the week, and is a great example of the type of food I eat for dinner every night. Plus, the salad contains not one, but TWO of my favorite root vegetables: radishes and jicama. One lucky winner will receive a copy of Heather Christo’s cookbook, Pure Delicious. All you need to do to enter the giveaway is leave a comment on this post. The giveaway ends Wednesday, May 25, 2016 at midnight EST. The winner will be notified by me through email and will have 24 hours to respond before a new winner is selected. Or, if you don’t want to chance it, you can purchase Heather Christo’s Pure Delicious now through Amazon.com right now! In a blender, combine all of the ingredients for the vinaigrette. Puree on high until smooth and season with salt. Set aside. In a large heavy pan, heat the oil over medium heat. Add the red onion and bell pepper and sweat for 5 to 7 minutes. Add the turkey and cook, breaking it up with a wooden spoon, until cooked through, about 3 minutes. Stir in the chili powder, cumin, and salt. Add 1/3 cup of water, stir, and cook until turkey is completely cooked through and water has cooked off, 3 minutes more. Remove from the heat. Arrange the cabbage and romaine hearts on a large serving platter or individual plates. Top with the jicama, radishes, cilantro, and chile. 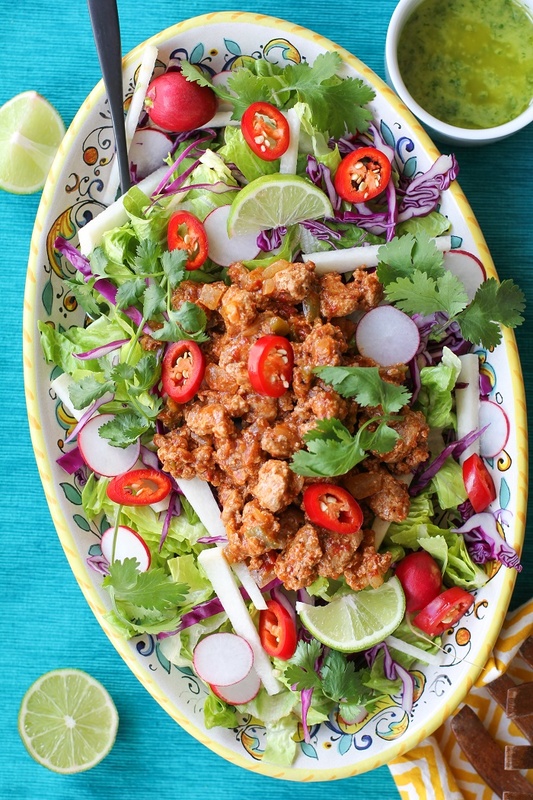 Spoon the ground turkey on top and drizzle the salad with a generous amount of the vinaigrette. I’ve seen so many sneak peaks of this cookbook and it looks and sounds fantastic! I’m always looking for new and creative recipes! That taco salad is giving me all the feels! Yes! So excited for Heather’s book! Her recipes are always so drool worthy! I would love to win this book!! So many yummy things! Excited to get this book! I love when someone can share their experiences with multiple allergies/intolerances. Even with years of practice, I sometimes have a hard time coming up with substitutions of one specific intolerance within a multi-excluded recipe. It’s also so refreshing to get ideas for new things to try that mix up the palate while still staying true to what makes your body happy! Wow love this concept! Want To win!!! Love the beautiful cookbook photos! I always look at the photos to decide whether a recipe is worth trying. Can’t wait to try this recipe! I love the Roasted Root blog… so many yummies, and I always get to read with a smile on my face. AND, Heather’s book needs to come home to my kitchen. This is my kind of cookbook since I have 4 intolerance/allergies. This salad looks delicious. I need to make ASAP! This cook book looks wonderful and the taco salad recipe looks delicious! I can’t wait to try it! Heather’s book is stunning!! You said it exactly, it is the ultimate guide for living an allergy-free lifestyle. You did a beautiful job showcasing her taco salad. These photos are so bright and summery! How exciting… I was just looking at this cookbook on Amazon and now I was notified about it here on The Roasted Root!!! I cannot wait to try these delicious recipes!!! I love good cookbooks, and this one looks amazing! I would be so happy to win it. This recipe is going to be made tonight! I would love to see all the alternatives for the food sensitivities and better ways to make food. My son-in-law has food allergies. My daughter and husband have similar food sensitivities. My other daughter has different food sensitivities. I have my own sensitivities and would love to see all the alternatives and better ways to make food than the traditional ways of making the food. I’m sure a lot of the recipes would be beneficial to helping to loose weight too. Learning how to adjust to celiac and kids with food allergies, and am determined to not resort to processed junk. This book looks great! The pictures that you shared with us are stunning. If the recipes are 1/2 as good, and you said they were, then I’d be one happy winner!!! I can’t wait to dive into this book! 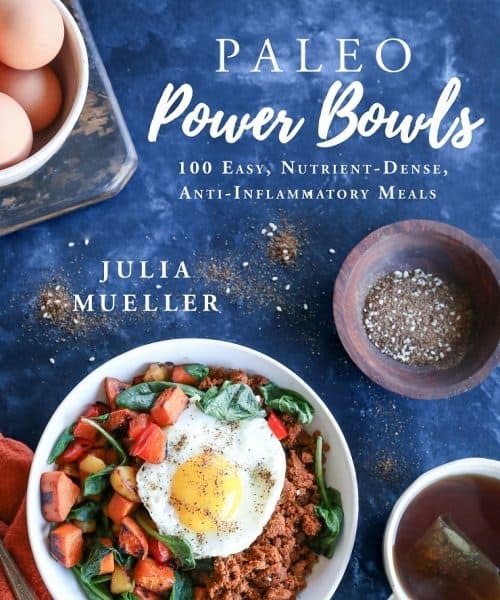 Thanks, Julia, for your honesty about how difficult it is to eat for health, no matter how much information you have! I struggle with this, too. Temptation is everywhere, and it’s a real PRACTICE to stay conscious enough to admit to myself when I’m making excuses and justifications for doing what I KNOW will cause me troubles! And, as always, thanks for your beautifully presented recipes and pics! I’m making this for dinner tonight! Looks like a great book. I’ve recently had to start eating this way as my health went sideways over the last few years. I’m liking the healing I’m experiencing! I LOVE Heather’s blog. Her cookbook would be the perfect addition to my collection!! I love the pictures and list of recipes. I had forgotten all about using Jicama in a salad (turkey taco salad). Would love to browse the whole book. This dish looks delicious. This would be great to win because I am trying to get myself on a healthy eating lifestyle. I need to really start taking care of my body! yum!! sounds and looks delicious! Cannot wait to try! I would love to win a copy of this book! MY whole family suffers from food allergies AND intolerance’s, so this would be a great way to educate them that allergen-friendly eating doesn’t have to be boring or lackluster. The taco salad looks delish. Can’t wait to try it and to check out the other recipes in Heather’s book. Oh my yum! Will be making this taco salad this week and am definitely interested in the book! That salad looks absolutely delish! You’ve inspired my dinner tonight. Great looking cookbook. This cookbook looks amazing. It’s going on my birthday wish list for sure! So excited about this giveaway!! My little girl and I both have severe food intolerances, so Heather’s beautiful cookbook would be wonderful to have. Dang, that salad looks delicious! Also, think of it this way…no bananas means no thunder thighs or beer gut. 😉 And you know the struggles we have over here with Jerry’s stomach. At least he did outgrow the allergies, but the sensitivities remain. I’m so hungry this post is painful! This book looks great. I’ll have to make some room on my shelves. I love cookbooks with beautiful photos. The recipes look amazing. I would love to win this one.